By Allan Fox: WBC president says they’ll be considering a request from WBC light heavyweight champion Adonis ‘Superman’ Stevenson, if it comes, to fight a rematch against Badou Jack and put off his WBC mandatory challenger Oleksandr Gvozdyk (15-0, 12 KOs) until after that fight is made. The troubling part about the WBC possibly letting Stevenson bypass his mandatory Gvozdyk is the fact that he hasn’t fought a mandatory challenger in five years since his win over Tony Bellew in 2013. Stevenson’s previous mandatory Eleider Alvarez accepted step aside payments so that Stevenson could make voluntary defenses against weaker opposition. Now that Alvarez is no longer in the picture, Gvozdyk could be the next mandatory that sees his title shot against Stevenson delayed. The WBC will play a role in Stevenson steering around Gvozdyk if they grant an exception. Stevenson’s promoter will need to ask the WBC for them to give Adonis an exception to take the Jack rematch instead of Gvozdyk. 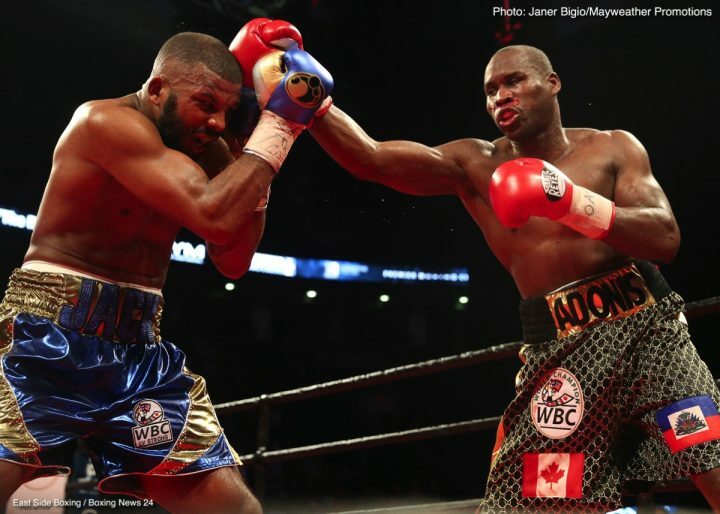 The 40-year-old Stevenson (29-1, 24 KOs) fought to a 12 round majority draw last Saturday night against the #1 WBC rated Badou Jack (22-1-3, 13 KOs) at the Air Canada Centre in Toronto, Canada. It was a close fight with Stevenson getting the better of Jack in rounds 1 through 6, and then wearing down in the second half of the fight and needing to literally hold on to escape with a draw. The scoring was a little questionable. Stevenson got the better of Jack in rounds 10 and 11. If you gave those two rounds to Stevenson, then he should have been given the decision victory, because he clearly won the first 6 rounds. None of the first six rounds were remotely close. because Jack wasn’t throwing a lot of punches. It’s quite likely that the WBC will give Stevenson permission to fight Jack again. That’ll be bad for Gvozdyk, because he’ll need to wait a little longer before he gets his title shot, and there’s no telling whether he gets the fight with the winner of that fight in 2018. If Stevenson loses to Jack, then there will likely be a third fight directly. That’s predictable. So instead of Gvozdyk waiting until after the second Stevenson-Jack fight, he may need to wait until a third fight takes place. Last year, Jack vacated his WBA title immediately after beating champion Nathan Cleverly last August. Jack would have had to defend the WBA title against Dmitry Bivol if he’d kept the title. If beats Stevenson in a rematch, it’s possible he could vacate the WBC title rather than face Gvozdyk. In that case, Gvozdyk may end up facing someone else for the WBC belt. Gvozdyk’s manager Egis Klimas says he has a leter from the WBC saying that his fighter will be next for Stevenson. Klimas believes the WBC will let Gvozdyk face Stevenson next rather than wait for a second Stevenson-Jack fight. Klimas doesn’t seem to realize that the WBC has been letting Stevenson swerve his mandatory challengers for the past five years. Why would thy suddenly make him change this pattern now? The way Sulaiman is talking, it’s more likely than not that the WBC is going to allow him to bypass his mandatory challenger Gvozdyk in order to fight Jack again. « Tyrone James – Is he a STAR in the making?